Pacific Wrens are given much credit for their beautiful sophisticated singing. They have even been called masters of song complexity. And for a good reason too. For such tiny bird their singing is remarkably impressive. Their entire body shakes with sounds when they sing and these good vibration resonate across evergreen forests where they live. You will never tire of them as they produce many variations of their melodious tunes. 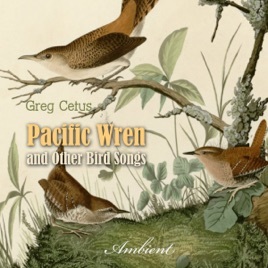 This recording features beautiful pacific wrens in their natural habitat together with other birds of pine forests. Here's a selection of individual birds you may be able to hear in this recording: Pacific Wren, Vesper Sparrow, Western Kingbird, Northern Harrier, Rufous Hummingbird, Greater Roadrunner, Virginia Rail, Great horned Owl, Warbling Vireo, American Bittern, Purple finch, Wilson's Warbler, Bald Eagle, Northern Flicker, and a variety of smaller ground and aerial forest creatures and plants.